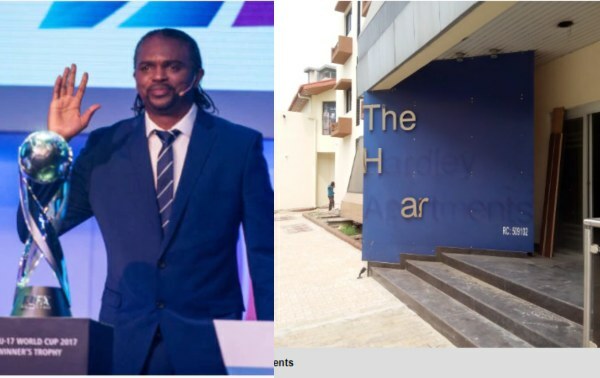 Thieves reportedly invaded Kanu Nwankwo’s Hotel, The Hardley Apartments located at Waziri Ibrahim Crescent on Victoria Island, Lagos and reportedly stole all his football medals, trophies, plaques, and other valuable items. Kanu Nwankwo who learnt that his hotel which has been sealed up since 2015 sequel due to an alleged default in transaction between it and Skye Bank (now Polaris Bank) was being occupied by some authorized persons who had also commenced renovation of the facility in disregard of the seal order and litigation, was forced to arrive in Nigeria over the weekend to verify the claims. The hotel has been through series of litigation which is still pending at the Federal High Court, Ikoyi, Lagos, and it was gathered that the last hearing came up in November last year after which the case was adjourned till 31 January 2019. “It was a rude shock to me,” Kanu, who fought back tears at what the hitherto sprawling facility had become since the renovation started, told TheCable. “I almost couldn’t recognize the hotel as belonging to me anymore. This is the saddest day of my life as I cannot understand why this happens to me when the matter has yet to be settled in court. A man who was seen supervising the illegal renovation, told The Cable’s correspondent that he is a staff of the Assets Management Corporation of Nigeria (AMCON), leading to suspicion that the assets managers may have also disregarded the court proceedings by taking over the property. “This is unacceptable in all ramifications. I have not been served any notice that I have lost this property and until I am served the notice, it remains my legal property,” the former Super Eagles’ captain said.